Unfractionated heparin is a naturally occurring anticoagulant that is primarily in dialysis and heart lung machines to prevent blood clots as well as for the treatment of blood clotting disorders such as deep venous thrombosis (DVT) and pulmonary embolism. Unfractionated heparin is also highly popular owing to its immediate onset of action, simple laboratory monitoring, short half-life, ability to get reversed (protamine), and low cost. In the past few years, the vast rise in usage of unfractionated heparin for the treatment of venous thromboembolism (VTE), deep vein thrombosis (DVT), and pulmonary embolism (PE) along with the massive rise in the number of surgical procedures that take unfractionated heparin as the preferred anticoagulant have spelled growth for the global unfractionated heparin market. Although unfractionated heparin is one of the most primitive forms of heparin, the narrow therapeutic window and risks associated with bleeding act as the major restraints to its uptake, thus stifling the growth prospects of the market to a certain extent. Patent expiration of majority of unfractionated heparin products has created a huge opportunity for generic and biosimilar manufacturers. The global unfractionated heparin market was valued at US$ 955.9 mn in 2016 and is expected to rise to an estimated value of US$1664.4 mn in 2025, expanding at a CAGR of 6.4 % from 2017 to 2025. Global unfractionated heparin market has been studied on the basis of two key sources, namely bovine and porcine. The porcine-based unfractionated heparin segment accounted for the dominant share in the overall market in 2016. Bovine-based unfractionated heparin was banned in the U.S. and Europe region post 1990s due to the spread of bovine spongiform encephalopathy (BSE) disease in cattle. However, the Center for Drug Evaluation and Research (CDER), U.S., has recently proposed the re-introduction of bovine-based heparin due to shortage of porcine sourced unfractionated heparin. On the basis of distribution channel, the segment of hospital pharmacies dominates the market owing to the rising number of hospital surgeries and hospital stay. Rise in use of internet, and surge of e-commerce are expected to boost the growth of online pharmacies segment in near future. The global unfractionated heparin market by geography has been studied for North America, Europe, Asia Pacific, Latin America and Middle East and Africa. North America is presently the leading contributor to the global market owing to the vast prevalence of DVT and PE in the U.S. Studies suggest that in the U.S., nearly 900,000 people are affected by DVT every year. Approximately 50% of DVT/PE patients develop long-term complications and one-third would have a recurrence within 10 years. Thus the demand for unfractionated heparin is high in the region. Europe follows North America in terms of growth opportunities for the unfractionated heparin market. The burgeoning geriatric population on dialysis and rising incidences of coagulation disorders in the region are attributed to the high demand for unfractionated heparin in the region. Asia Pacific, Latin America, and Middle East and Africa are largely untapped regional markets and are expected to be the fastest growing markets during the forecast period. Data from the National Institute of Health Consensus depicted that the overall incidence of DVT after elective hip surgery in India is around 45% to 70%, whereas the probability of PE is approximately 20%. 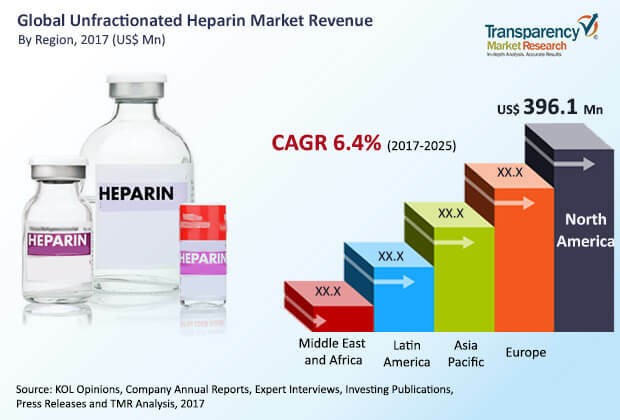 Growing economy, healthcare infrastructure and increasing number of surgical procedures in Asia Pacific, Latin America, and Middle East and Africa are likely to boost unfractionated heparin market in these regions. Some of the leading companies in the global unfractionated heparin market are Fresenius SE & Co. KGaA, LEO Pharma A/S, Pfizer, Inc., B. Braun Melsungen AG, Baxter International Inc., and Sagent Pharmaceuticals. Based on the source, the unfractionated heparin market has been segmented on the basis of source into: bovine source and porcine source. Based on the distribution Channel: it can be segmented into Hospital Pharmacies, Retail Pharmacies and Online Pharmacies. Each of the market segments have been extensively analyzed based on the market related factors such as increasing adoption rate worldwide, technological advancement, and growing number of use of disposable products in various geographies. Moreover, historical year-on-year growth have been taken into consideration while estimating the market size. The market size and forecast in terms of US$ million for each segment has been provided for the period from 2015 to 2025. The report also provides the compound annual growth rate (CAGR %) for each market segment for the forecast period from 2017 to 2025, considering 2016 as the base year. Geographically, unfractionated heparin market has been segmented into five major regions: North America, Europe, Asia Pacific, Latin America, and Middle East & Africa. The market size and forecast for each of these regions has been provided for the period from 2015 to 2025, along with their respective CAGRs for the forecast period from 2017 to 2025, considering 2016 as the base year. The report also provides with market size and forecast for major countries in the respective regions. A detailed qualitative analysis of factors responsible for driving and restraining the market growth and future opportunities has been provided in the market overview section. This section of the report also provides with market attractiveness analysis, Porter’s five forces analysis, market strategy overview, and market share analysis by key players, thus presenting a thorough analysis of the overall competitive scenario in the global unfractionated heparin market.